Organized storage is important to me. I am one of those people that often forgets that I have something if I don’t see it. 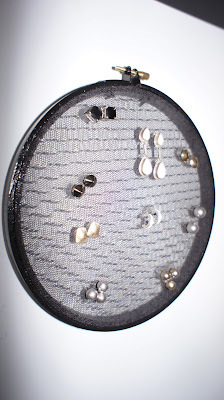 I already have an awesome jewelry organizer for my earrings, but the little studs kept on getting lost along with the larger drop earrings. I went on a search for something that would display the stud and not take up a lot of room. Being minimalist, we don’t have anything out in the open cluttering up the bedroom. I really liked some of the items that I saw in the store or online, but they weren’t really my style and they would have to go on our dresser. I didn’t want that kind of display so, as usual, I made the decision to make my own. Searching the web brought me here. I liked that I could hang this in my closet and it wouldn’t take up much space. This past weekend Joann Fabric and Craft Store had a coupons for 20% your entire purchase as well as a 40% off one item. They always have the 40% off one item online or in their circular, but the other coupon was an added bonus. I was also able to use my teacher discount (15%), lucky me. I bought 12 inches of black point d'esprit nylon that came to $1.66. I liked the look of that instead of the regular lace because it was more modern and not ornate. We're trying to showcase the earrings here, not the lace backing. That was enough fabric that would allow me to make another holder for friends. I also purchased two 7-inch embroidery hoops for $1.26 each and I saved a $1.00 off of those thanks to the coupons. After taking apart the hoops, I spray painted the hoop black to match the black netting. I already had the spray paint so that was free. I didn’t spray the pin that screws together the two hoops. I kept that to the side. I then cut out the black point d’esprit to fit the hoop with excess on the side. I doubled up the fabric to make it stronger for more earring. I then put the hoops together and tightened with the screw. Once it is completely tight and you cannot screw the pin any longer, pull the fabric from the sides so it is taught. Finally, with fabric scissors, trim the edges around the entire hoop. So easy and really quick. I hung mine up on the wall in my closet. I realized I have been choosing to wear the studs more now that I see them on display.